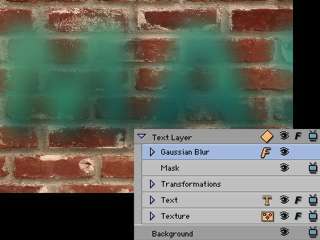 This tutorial assumes you have Boris FX6, or Red or Graffiti or thinking of buying Boris FX6, or Red or Graffiti or just want to know something about Boris FX6, or Red or Graffiti. In any event, if you read this tutorial you are going to learn something pretty cool. A recent 2-pop post asked about methods for applying glowing highlights to video, and I offered a quick reply, which you can find here. I wanted to offer more detail than that, though, because adding glows to video is useful for so many applications. I can say the same thing about the tools in Boris for creating those glowing effects -- this is a specific use for two extremely powerful tools that you'll be glad you know about: PixelChooser and Apply Modes. 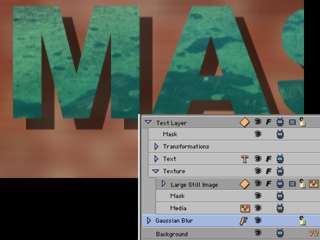 Although PixelChooser has been around for a long time, Apply Modes are among the many new tools in Boris FX 6. That's where I'll begin, although the same features exist in Boris RED. Pixel Chooser deserves its own wacky devotional shrine website, piously and copiously cataloguing every capability and sacred utterance, with the odd compendium of sightings around town with mysterious escorts of indeterminate gender. (As choosy as it is otherwise, Pixel Chooser is gender neutral.) 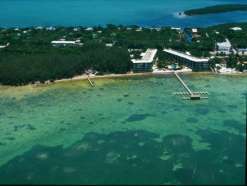 I may yet build such a site. For now, though, I'm going to hit the barest of highlights on our way to adding highlights to video. On first glance, the Pixel Chooser doesn't look like much. The button in the upper left makes selections based on Region - animatable garbage masks, if you will. This ability to apply a filter to only a portion of a layer, and to animate the size and position of that area, is one of the most powerful aspects of Boris FX. It's easy enough to build masks in applications like Photoshop, but PixelChooser removes the need: it's simpler and faster to perform the masking from within the filter. PixelChooser also provides faster rendering by not adding another layer to the render. Good stuff, but I'm skipping this for now to make a selection based on Channels. I'm assuming that the M on this tab stands for Masks, but all you need to know is that M is for Channels. 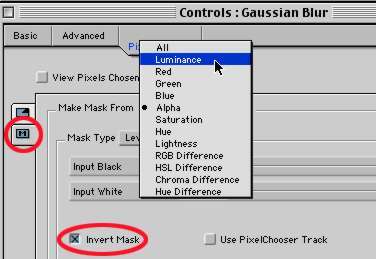 The filter best suited to creating a glowing effect is Gaussian Blur. But you can imagine that a high level of blur applied to an entire layer wouldn't create a glowing effect. It would create, well, a blur. By using the PixelChooser to blur only the Luminance, I can create a very nice glow indeed. Depending on the specifics of the footage, though, I find that I can create an even more satisfying glow by inverting the selection. That's it! 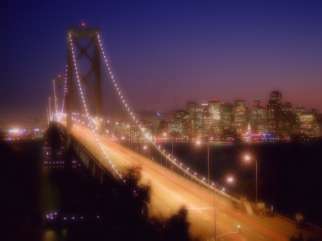 A couple of clicks to create glowing highlights: apply a blur, and limit it to the Luma channel. Before we move along, let me show you a couple of other glowing highlights in PixelChooser. I can adjust my selection as easily as I made it. For playing with the Luminance channel, it can be easier to view the selected pixels. White pixels are masked, black pixels are unmasked. I can adjust the area selected, as well as blend the selected and unselected areas, simply by tweaking the levels of black and white in the mask. I can also build my mask on the threshold or range of the pixels selected, each of which offers even more kinds of controls. Even this is really only the beginning of what PixelChooser can do. I can even use the channel-based information from another layer to provide my mask! It's as simple as selecting Use PixelChooser Track, and using the Media pop-up menu to select another layer. 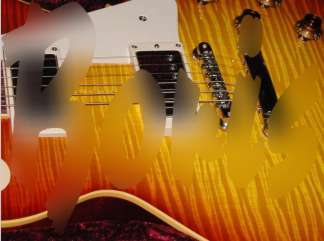 Here I've used the alpha channel from a Photoshop file to provide a mask for my blur. Still not enough control for you? I can go further and combine the two kinds of PixelChooser masks. I could create an area-based mask, say, selecting everything within 180 pixels of a selected point, and combine it with a channel-based mask to customize my selection any way I want. This is getting a little scary, so I'll offer a more practical PixelChooser tip before we move on. DV footage tends to be very clean, which makes any noise even more apparent than it would be in analog footage. Indeed, mixing analog footage in with DV can sometimes be jarring. PixelChooser can easily deal with this, too. Noise is contained almost exclusively in an image's Blue Channel, which you can see as you view each channel independently. The pop-up menu for this is at the bottom of the Composite Window. 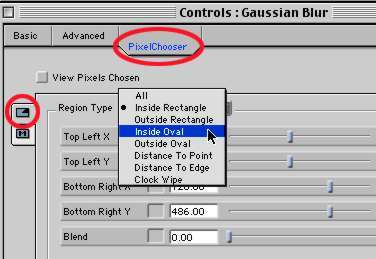 Using PixelChooser to apply a blur in the Blue channel is thus often all you need to reduce noise to acceptable levels. If you find that this softens the edges in your image too much, use PixelChoser to apply an Unsharp Mask filter to the Green channel, where edge information is strongest. This is more than enough to give you an idea that PixelChooser goes well beyond the range of any traditional conception of masks and video filters. For more specific details, check the Filters Guide PDF. It should have been installed in your documentation folder when you installed Boris, and it's also on the installation CD of course. Remember that I told you that you can't apply filters to video in Graffiti? It's mostly true. In general, Graffiti is a text and graphics tool, unlimited layers of 'em over a single layer of background video. The manual will tell you plain and simple that you can't filter the background video, which is why the first thing I tried to do was exactly that. I selected the background track and added a Gaussian blur. While Graffiti couldn't apply the filter to the background layer -- just like it told me in the manual -- it DID add a filter layer to my effect. It just added it ABOVE the background layer, And behold, the result was exactly the same as if I'd applied the filter directly to the background! You may have heard of adjustment layers, and this is what they do: they filter the layers underneath them. They act sort of like a lens that way. We don't call them adjustment layers in Boris, though. We just call them filters. You can slide them around anywhere you want to produce the desired effect. In the example here, I took a very large still image and animated its position and scale, documentary-style. This is a small version of it, but honest, it's a large still. (You knew Graffiti could do animate large stills, right? If not, get thee to the Boris website to learn how. http://www.borisfx.com/timscorner/graffiti.php) Take a look at the unflitered version. 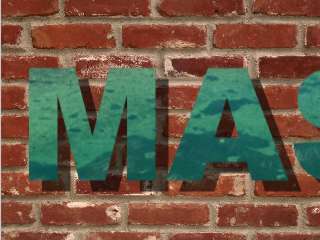 Then I used the animated still as the texture track of some text. I'm going to take the same Gaussian blur, and drag it to three locations. This illustration shows you what the blur looks like applied to my text layer. Eek. Not very nice, but you can see that it's blurring the text. Next, I click and drag the blur layer to the FACE of the text, but not the outline. The text itself is nice and sharp, but the image IN the text is blurred. Finally, I'm dragging the blur to the background layer. Pretty sneaky, eh? There are limits to what you can do with this dodge in Graffiti. You really can't add a second layer of video, for example. 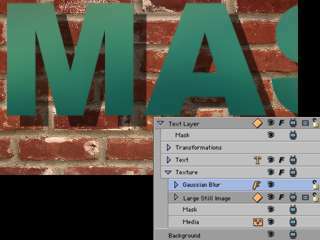 Graffiti is a GRAPHICS tool, for building effects with unlimited layers of text and still images, although you can map video to the surface of 2D and 3D text. If you want unlimited layers of VIDEO for your filtering pleasure, that's Boris FX. Boris RED offers the ability to combine both unlimited layers of text and unlimited layers of video. For now, I'm going to continue showing you Boris FX 6, where, for my next trick, we'll need two layers. Another way to add glowing highlights is with Apply Modes. Boris applications are not the only ones to offer compositing Apply modes, of course. Other applications may use names like Blending modes, Compositing modes, or Transfer modes, but the purpose is the same in all of them, to use the mathematical values in two layers to control how those layers are combined. As a result, they're the key to compositing layers, that is, controlling how the transparency of layers interact. Apply modes are among the most important tools to grasp in at least a general sense, if not in the daunting detail of the math. 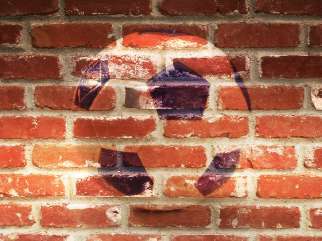 Better still, let me direct you the Keyframer, and its famous (or infamous) ball and brick wall images. Keyframer is a standalone effects creation utility that allows you to build effects outside of FCP. You don't even need video: we've provided two files, images a ball and a wall, to stand in as proxies for video tracks in FCP. 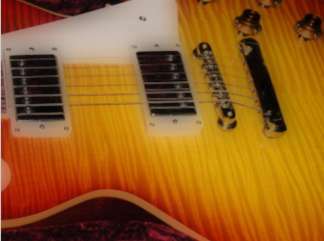 Aside from being handy, these two files offer an excellent way to learn Apply modes. The contrasting luminance and hue values of the two images also provides an excellent approach to quickly seeing the effects of each of the Apply modes, without the unpredictable results (nothing at all, or complete black) that can come from mixing unsuited images and modes. You might surmise from the word "mode" that Apply modes are, well, modal. That is, they're either off or on. That is indeed the case with most applications, but not in the world of Boris. A true animation application, FX allows modes to be animated in a variety of ways. 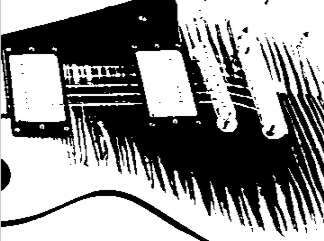 The ability to animate, even combine apply modes, as well as the ability to adjust things like brightness and contrast within those modes -- these are all among the features that make Boris's approach to apply modes unique. 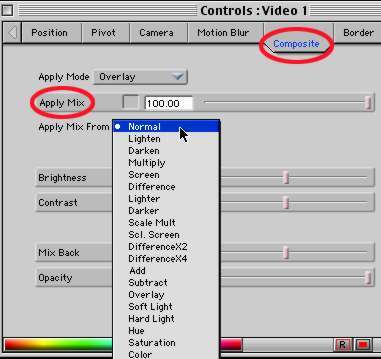 Go to the Composite tab for Video 1 and set the Apply mode to Overlay. It does pretty much what the name describes: it overlays the luminance values of the top layer on the one below. 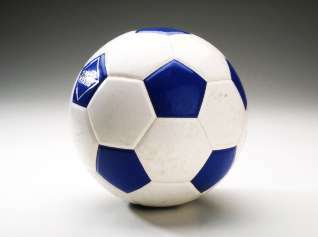 Note, for example, that you no longer see the background of the ball layer, and that the brightest parts of the ball image have been overlayed on the layer below, making the wall much brighter in those areas. Hmmm.you think the Overlay apply mode might somehow be useful for creating glowing highlights? One of the tricks that compositors use with Apply apply modes is to apply them to copies of the same layer, so let's do that now to get a practical example of mixing modes. I'm going to use the Media pop-up menu to switch Video 2 to Video 1, and you can see the results. By overlaying the image on itself, the highlights and shadows are both exaggerated. At this point, we have the highlights we want, but not the glow. That's easily added with a Gaussian Blur. You can flavor yours to taste, but in this case, I found that a blur of 60 got me where I wanted to be. This particular recipe (Apply mode of Overlay, 60% mix with Normal) works well for footage with more emphasis on highlights than shadows. This is the recipe that I applied to the same guitar footage I used earlier, for example, and it works fine here. But you may need to experiment if your footage varies. For example, this cityscape required a different approach. I used an Apply mode of Screen, which effectively doubles the highlights without affecting the shadows. I like the Apply mix of 60, which did a nice job of lightening the image while preserving the detail. (This is much less destructive than a typical Lighten filter, and the controls in the Composite tab also offer much, much more control.) Since the highlights are already quite bright at this point, a soft blur (Gaussian Blur, 15 pixels) gave me a very pleasing result. It's strictly a matter of preference which method will work best for you, and it will vary from footage to footage. While the apply modes are unquestionably more flexible, the PixelChooser method is faster to both create and render, because there's only one layer instead of two. The ability to animate Apply modes is an exceptionally powerful tool for building dramatic compositing effects, and it bears much more discussion than I give it here. As with PixelChooser, I've only touched on a few glowing highlights. These are just a very few of the reasons why Boris FX makes such a compelling addition to the already very powerful compositing in Final Cut Pro. It takes the powers of FCP and extends them. I know that thousands of you have already started to explore this combination, and I know you'll enjoy exploring some of the possibilities I've opened up for you here. Look for more tutorials here soon, and if you can't wait, swing by http://www.borisfx.com/timscorner to take a look at some others. Tim Wilson, Man About Town, is the Director of Marketing for Boris FX. Before that, he used Boris daily in the production company that he owned for the past ten years. He's a frequent poster in many 2-pop forums, and speaks regularly at Final Cut Pro user groups around the country.